Did you know that as many as sixty-nine percent of adults between the ages of thirty-five and forty-four have lost at least one of their permanent teeth? That may seem a little scary, especially if you’re in that group. But the good news is that dental implants, here in Brentwood and across the country, are better than they’ve ever been, and are expected to keep getting better. Dental implants, as you may know, are replacements for teeth that have been extracted or knocked out. 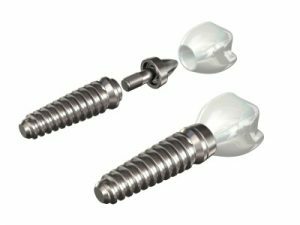 The implant itself is a titanium post that is permanently inserted into the patient’s jawbone. It replaces the missing tooth’s natural root. On top of the post is a support structure called an abutment. A restoration tooth, or crown, goes on top that. Not so long ago, dental implants were available but uncommon. Today they’re considered part of mainstream dentistry. Most people who are missing a tooth are candidates for getting an implant. There aren’t that many restrictions. One very real restriction, however, is whether the patient has enough bone in the jaw to support an implant. And patients who have had radiation therapy may not be viable candidates, because the radiation might prevent the implant from fusing to the bone. At the Nashville Center for Aesthetic Dentistry near Brentwood, Dr. Dennis Wells has more than thirty years of experience with cosmetic dentistry. He and his staff would love to hear from you. Call 615-371-8878 for a consultation, or to find out more.